Be the first to share your favorite memory, photo or story of Veronica. This memorial page is dedicated for family, friends and future generations to celebrate the life of their loved one. Veronica M. “Ronnie” Guzinski was born on March 21, 1949 in St. Clair Shores, Michigan. Cookie, as she was known to her family, was the youngest child of the late Maurice and Mary VanDoorne. 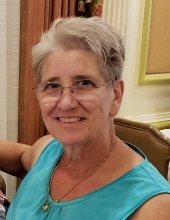 She passed away on January 26, 2019 in Commerce Township, Michigan at the age of 69. Ronnie was the loving wife of Gerald for 45 years. Cherished mother of Scott Steven (Virginia) Guzinski and Constance (Brian DeSmet) Guzinski. Proud Gram of Joseph, Mariella and Arianna. Dear sister of Ron, Robert (Marilyn) and the late Thomas (Prudy) VanDoorne. An avid golfer, Ronnie met every Wednesday with her friends to golf. She loved to be out on the green. Above all else she loved her family, especially her grandchildren. She was a kind, loving and wonderful woman who will be deeply missed by all those who were lucky enough to have known her. Ronnie’s family will receive friends for visitation on Wednesday, January 30, 2019 from 3-8 pm at Lynch & Sons Funeral Home, 340 N. Pontiac Trail (3 blocks south of Maple Rd) in Walled Lake. Her life will be celebrated with a Funeral Mass on Thursday, January 31, 2019 at 11:30 am at St. Mary Our Lady of the Snow Catholic Church, 1944 E. Commerce (West of S Duck Lake Rd.) in Milford. Friends may visit the church beginning at 11 am. In lieu of flowers memorial contributions are appreciated to Cappuchins or St. Jude Children’s Research Hospital. "Email Address" would like to share the life celebration of Veronica M. Guzinski. Click on the "link" to go to share a favorite memory or leave a condolence message for the family.